Happy Halloween! From our goofy little perfectly normal family to yours. P.S. I love living in a town where homemade gluten free cookies are part of the Halloween deal. P.P.S. Yes, there was also a lot of skanky candy. Here's where it's going, in case you need inspiration! Some of the less questionable stuff is sticking around, and another bag of treats that I just can't let my kids eat is being taken to the coop for a trade out. Since I give them a little extra trade in value they're jazzed by my hippie up-sell. How to stay sane when your schedule gets manic. ACK. Love love love. A very bewitching All Hallows Eve to you. And yes – you guessed it right my dear! Yea for Steampunk! I must be entirely out of the loop as I haven’t a clue what Steampunk is. You all are totally adorable. 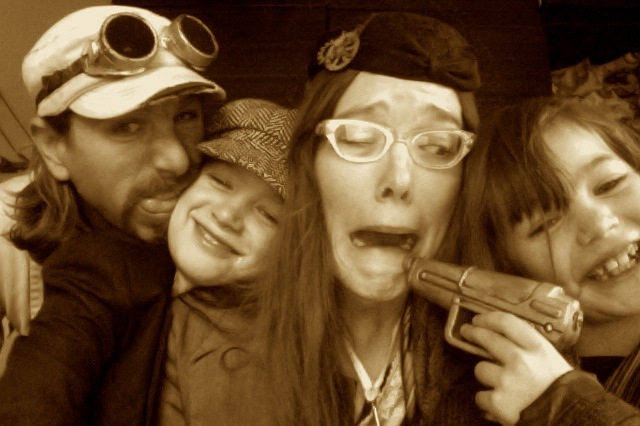 We did steampunk last year as a family. It was awesome. I even made the baby a pair of wool felt pilot goggles on a pilot cap. Have fun today! Adordable! So glad we’re not the only ones. Goofy is totally acceptable in a perfectly normal family! You all look fantastic! Love the steampunk! Halloween can be so much fun. Haha, so funny! What a beautiful family.